Seven Tools of the Bandit is a Trap Card that reads: Pay 1000 of your Life Points to negate the activation of a Trap Card and destroy it. IMO this is the second best counter in the set (After Magic Jammer). 1000 Life Points may seem a little steep, but it's really not that big of a deal. The best time to play Seven Tools of the Bandit is when your opponent either plays Mirror Force or when your opponent uses a Magic Jammer to counter one of your important Magic Cards. The whole purpose to Seven Tools of the Bandit is to counter Traps. There isn't much more to it. Yay, it's my week again! To start off, we're going to look at yet another Ultra Rare counter trap, Seven Tools of the Bandit. If you look up the definition of "tech" in the dictionary, you will see two pictures there. You will see Brock's Mankey (sorry, had to steal that from a Pokemon CotD, don't hurt me!) and you will see Seven Tools of the Bandit. This card makes an unpleasant surprise to your opponent. 1000 LP is a small price to pay to negate a card like Mirror Force or Magic Jammer, which can be game-changing cards. The problem is, those are the only two traps that are worth paying 1000 LP to negate. Trap Hole is a pretty big threat, but it's only worth negating in a VERY tough spot. Robbin' Goblin is a big threat as well, but it's not nearly as threatening as Mirror Force, and I have seen its popularity decrease. Furthermore, normally people only play 1 in a deck (I personally use 2, which I should probably put 1 in my side deck), so it will be pulled about as often as Mirror Force. Besides, you can use that extra slot in your deck that a 2nd Seven Tools would occupy and put in another efficient 1000 LP cost critter, Dark Elf, which can make your opponent's Robbin' Goblin harder to penetrate your defenses. Of course, no card is without some kind of counter. Seven Tools of the Bandit is weak to a few popular cards, namely, Heavy Storm, Solemn Judgement (which has REALLY picked up popularity lately), and, of course, Seven Tools itself. This would imply that playing 1 would be a bad idea. Of course, people still go with 1 Robbin' Goblin even though that Robbin' Goblin can get nuked by Heavy Storm or even the Dragon-deck tech Remove Trap. I would play 1 in your main deck and 1 in your side deck. If you run into excessive trap problems, you can then throw in another Seven Tools. Seven Tools of the Bandit gets a 3.4. 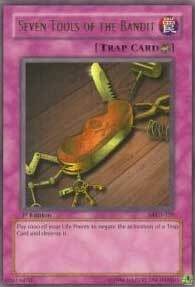 It's a very useful card, and the 1000 LP is a small price to pay to negate a card like Mirror Force, but truth is, there aren't many Traps that are worth using Seven Tools on. Just you wait, until we get more game-breakers like Magic Cylinder, Imperial Decree, and Deck-Destruction Virus of Death (e. Crush Card). Melkor Metal Raiders introduced tons of new things to the duel monsters scene. One of the more welcomed addition was the counter trap. Counter traps stop your opponent's from playing a fatal move and such. They're quite nice. So why don't I like Seven Tools of the Bandit? It's not so much the card itself - really, it's all traps, bar Mirror Force. I have some of the worst luck ever, and when I'm in a bad position, I draw cards I can't use. Like traps. I absolutely hate it. The card itself is VERY situational, however, and isn't very useful if you don't set it early. The cost isn't high, it's just...I don't like such situational cards. Play it if you want. I adapt my own style towards playing, as should you. If you feel you realllly need to counter some traps, by all means, use it. I, however, don't. Rating - 2.5 I can't rate it any higher or lower. See for yourself.